Silver is outpaced only by gold in terms of value and demand in the precious metals market. There are products available in a variety of styles and sizes, and 5 oz Silver Products are among the most unique. Today, Silver.com offers Miscellaneous 5 oz Silver Products for purchase online. Ships in a protective plastic sleeve or flip. 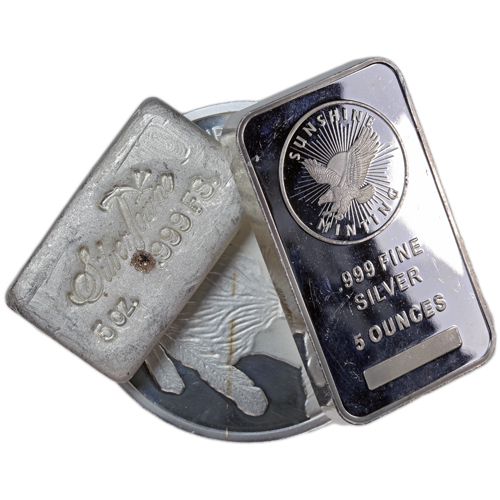 Most silver products in the 5 oz weight range are bars. Silver bars today are available in two primary styles; minted ingots and cast bars. 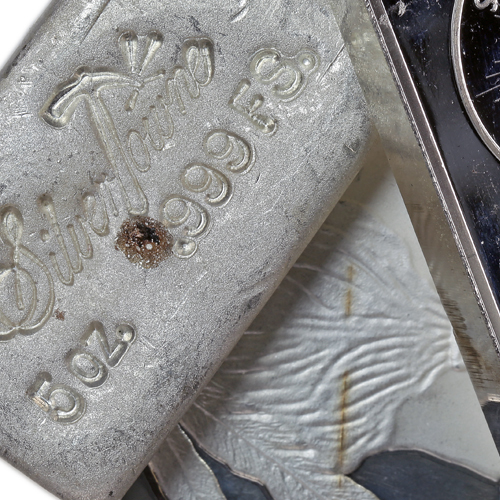 When it comes to initial value, cast bars are more affordable because the process by which they are produced is much less complex, allowing mints to sell them for lower premiums over the spot price of silver. For minted ingots, the process starts with the production of large cast bars that are then fed into a stamping press. This machine stamps out individual minted ingots that have exact specifications for size, shape, weight, and minimal fineness of the silver. As a result of this process, higher premiums over the spot price of silver are charged. Each Miscellaneous 5 oz Silver Product available to you today is a damaged item. There is no specific definition of damaged. Instead, you can expect to see any manner of minor imperfections on the surface of your products. In some cases, more obvious flaws or imperfections are visible. Silver.com does not guarantee either the condition of each individual product, or take requests for specific product lineups. Although popular options are silver bars from the likes of Monarch Precious Metals or the Atlantis Mint, we cannot guarantee which item you will receive. Your products are chosen based upon availability in our warehouse at the time your order is packaged for shipping. If you have any questions for our customer service team, please feel free to call us at 888-989-7223. Alternatively, you can reach out to us online using our live web chat feature or send us an email with your inquiries.